When I was in elementary school, my mom bought me a book full of American Girl Doll recipes and crafts. Each doll had her own chapter, and since I owned Kirsten, the blonde-haired blue-eyed girl who lived in the 1850s on the American frontier, I started with her. Yet I quickly moved on to Felicity and Samantha, the dolls from the colonial and Victorian eras, because I loved those historical periods. Eventually, I decided to try Samantha’s thumbprint cookies that she served during afternoon tea as my first recipe… Although Mom and I agreed on substituting afternoon apple juice for pairing instead! And then ate all four dozen over the rest of the afternoon and evening. Those cookies were that good! 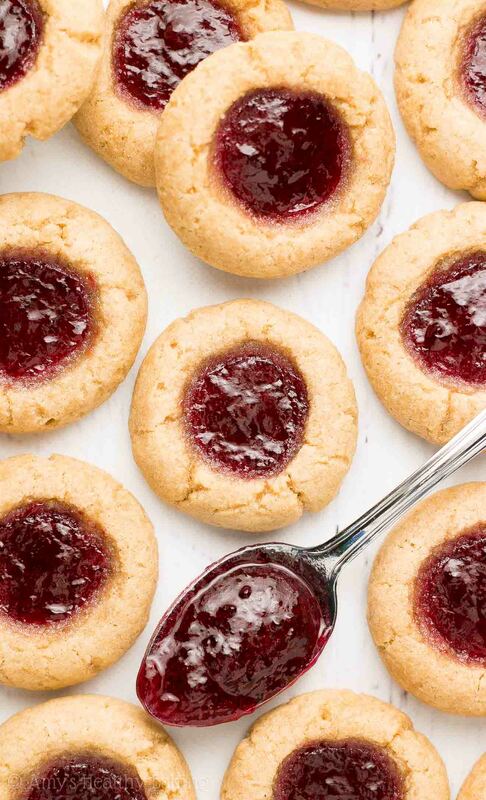 Years later, I finally perfected this recipe for Healthy Thumbprint Cookies. They taste just as soft and sweet and buttery as those originals… But these contain no refined flour or refined sugar, and they’re just 46 calories! You can watch the episode below where I show you how to make these healthy thumbprint cookies and get my recipe directly beneath the video. And remember to subscribe to my TV show here, so you’ll be the first to know when a new episode airs each week! You can find my Healthy Thumbprint Cookies recipe HERE! I owned the Samantha American Girl doll, so I’m especially happy to see your recipe inspiration here! 🙂 So interesting about why you added extra vanilla – again, this is why I appreciate your tv episode accompaniments to the recipes, as well as your always thoroughly written posts. 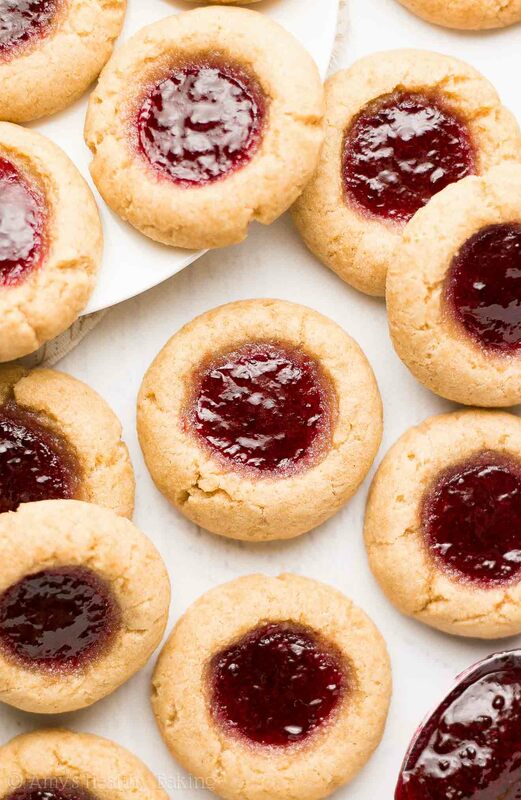 I always seem to forget about Thumbprint cookies, but they’re such a delicious, classic cookie! I love the way the jam gets kinda sticky after it’s been baked. YES!! My thoughts exactly about the jam! It somehow makes the jam taste even better… Which is dangerous! 😉 You’re such a sweetheart — thanks sweet pea!! Delicious! With all your recipes I keep on having the same problem, my batter is much drier than yours. It is still super tasty, but I want to figure out what I’m doing wrong. I have already looked that the baking for beginners section you have so I know that I am measuring the flour correctly. Any thoughts? Hi! I’m using the spoon and level method and coconut sugar. The other recipes I’ve tried are the oatmeal raisin banana cookies and the blueberry scones. Thanks!